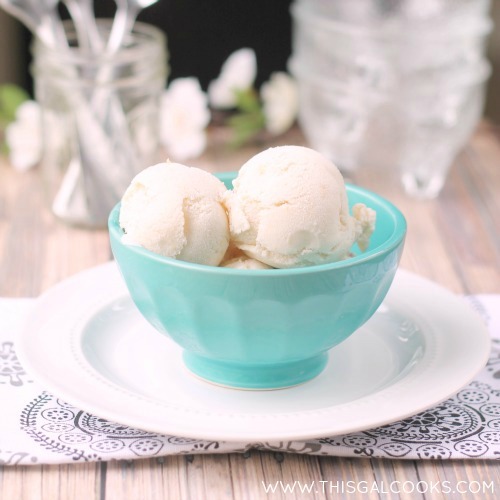 If you’re a fan of peaches and vanilla, and you can’t consume dairy (or choose not to for health or personal reasons) then you are going to love this Dairy Free Vanilla Peach Ice Cream! What pairs well with a hot summer day? A delicious bowl of ice cream! But if you are like me and you are trying to cut out dairy due to lactose intolerance, then regular ice cream is not an option. Now don’t get me wrong, I love regular ice cream. And I could probably pop a lactaid pill and be ok with it but I am not going to do that. I finally decided to accept the fact that most dairy bothers me. I seem to be ok with Greek Yogurt, so I will probably consume that occasionally. But as for everything else, including my main weakness, cheese, I’m saying goodbye to it all. That looks delicious, doesn’t it? That’s Dairy Free Vanilla Peach Ice Cream. I made it with fresh peaches, coconut milk, vanilla hemp milk, vanilla extract and sugar. Yep, that’s all you will find in this ice cream. None of those scary additives that you find in store bought ice cream. And none of that dairy that you can’t consume. I used regular, full fat coconut milk. I used unsweetened vanilla hemp milk. You can find hemp milk at health food or organics stores such as Whole Foods. Let’s talk about taste. This ice cream tasted good. But I think it would have tasted better had I used strawberries rather than peaches. The taste of raw peaches isn’t something I’m a huge fan of. But for some reason I was hell-bent on making vanilla peach ice cream so that’s what I went with. If you love peaches, you will love this. If you prefer other fruits, sub the peaches with something else! Enjoy the recipe! Puree the peaches in a food processor. In a mixing bowl, whisk together the sugar, vanilla, salt, hemp and coconut milks. Whisk in the pureed peaches and nutmeg. Pour the mixture into an ice cream maker and churn for 20 minutes or until thickened. Transfer the mixture to an air tight bowl and freeze for 1-2 hours if you prefer firm ice cream. If you like soft serve, go ahead and enjoy right away! 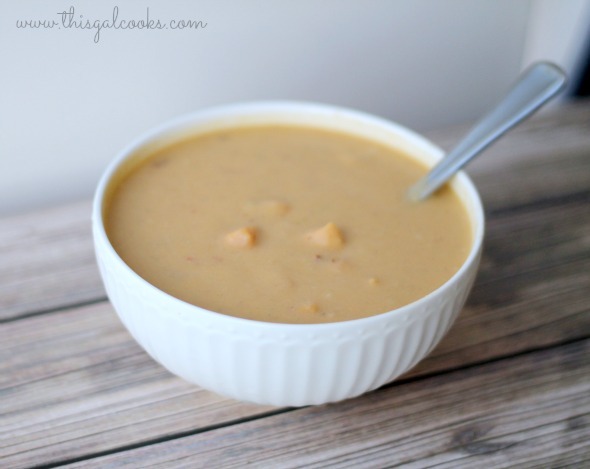 This is such a great recipe and I would never of known it was dairy free by the look of it! Nice! This is great Julie! Although I have no problem with dairy, some of our friends do, so this will be perfect for get togethers! You’re very welcome, LuAnne! Thank you so much for stopping by! Dairy-free? I would never have guessed. This look so delicious Julie. Love it! Pinned! Thank you, Anne! I think I want to try this with something other than peaches next time. Maybe strawberries! Thank you so much for stopping by! 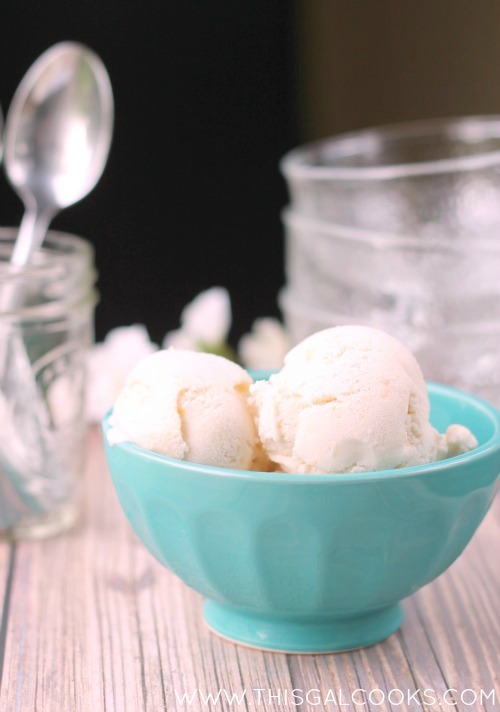 Yum….I was planning on making ice cream this week now that I found my ice cream maker :) It looks so smooth and creamy, great job Julie! Yay! So happy that you found your ice cream maker! I can’t wait to see what you make! I’m not lactose intolerant but I do use yummy coconut milk quite often to replace cream. Lovin’ it with summery peaches! I really need to make this ice cream. I can’t have dairy, and this looks amazing! Thanks for stopping by, Lisa! I’m finding that there are a lot of people who can’t have dairy. I’ll be making more dairy free treats in the future since I am trying to cut most of it out! Thank you, Heather! Oh it is so hard to do. My biggest problem is with cheese. Seriously, last night I wanted to dump a bag of shredded cheese in my mouth. I was putting the cheese on my boyfriends food and it was so tempting to eat but I didn’t do it! Thanks for stopping by! I’ve never tried almond milk before. I heard it’s very nutty tasting, which makes sense since it comes from almonds! I take the lactaid pills whenever I do eat some dairy (or if I’m not sure if dairy is in something that I am going to eat at a restaurant) but I am really going to try to cut out all dairy. However, I am going to have some fun with the Chobani yogurt when I get it! I’ll eat a little and share the rest with friends! Thanks, Krista! I can’t wait to make some things with it. I’m a little hesitant to eat any dairy so I may have to have other people taste test what I make but it will still be fun! I am already coming up with ideas. Thanks for the info on the almond milk. I may try it one day! Thanks for stopping by, Ashley! I’m glad that you like this recipe! Oh to go without cheese would kill me! 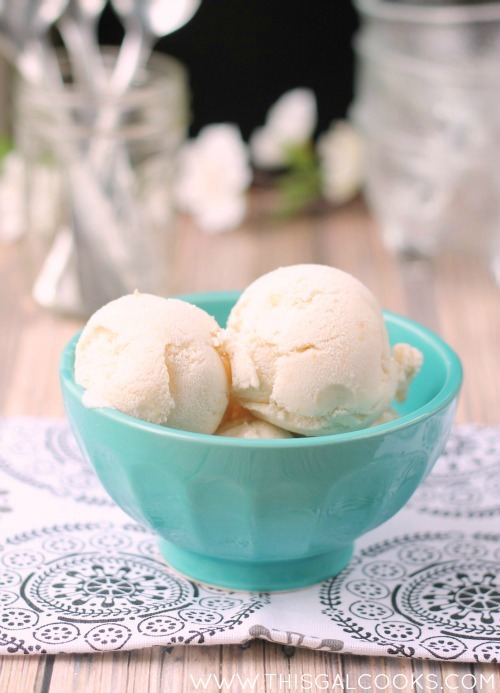 I do love the simple and natural ingredients in this peach ice cream. Looks perfect Julie! It’s killing me too, Tanya! I love cheese. But I am resisting the urge! Thanks for stopping by! Such a simple and beautiful recipe. I like my ice cream a little soft so I would eat it right away! You should be able to make it without an ice cream freezer. It was more like soft serve after it came out of my ice cream freezer and I preferred it to be harder so I put it in an air tight container and put it in my freezer before serving! Yum! I am ice cream obsessed lately, this looks wonderful. Looks delicious! I’ve been craving ice cream lately….! Peach is my absolute favorite ice cream! Could I sub almond milk for the hemp milk? I think it would work as far as the ice cream coming out ok but I am not sure the taste of almond milk would work well with peaches. I’ve never had it but I hear it is very nutty. I’m thinking it may go better with a chocolate version (minus the peaches) of this ice cream! Let me know if you try it! 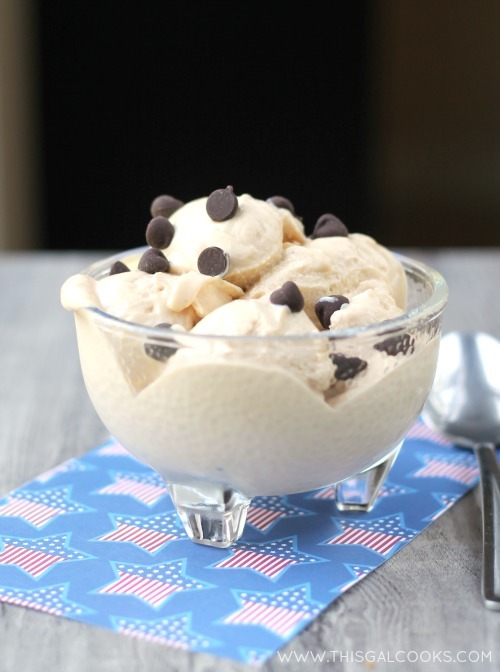 Already pinned…and planning to take out the ice cream maker bowl out of the freezer ready to go! Yay! And yep, I know all to well that they don’t always work! Thanks for stopping by, Gloria! This sounds really good! I have never had hemp milk, but it sounds like it is very good! The recipe name alone was enough to convince me of how good this could be! Thanks for sharing! Thank you so much, Debilee! Julie, thanks so much for sharing your recipe at Best of the Weekend! We love having you join us! Pinning to our party board – have a wonderful weekend! You’re welcome, Cindy! Thanks so much for hosting! I found the hemp milk at Whole Foods. It was the first time I was able to find it. My boyfriend heard about it a while back and wanted to get some. Let me know how it is with almond milk! Sounds different. 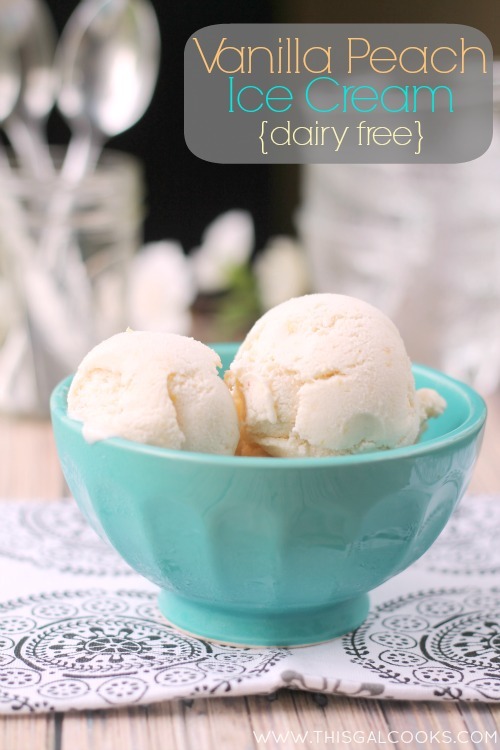 Never made a dairy free ice cream. Pinned! Thanks for sharing on Two Cup Tuesday! This was the first time I had ever made it. I am trying to stay away from dairy since it seems to bother me. It’s been a week since I have eaten any and when I did eat it, I had just a small amount of gyro sauce, after taking a lactaid pill. It’s been kind of hard to do this, as I love cheese, but I do feel a lot better now. :) Thanks for stopping by. Hope you are having a good weekend! This looks so incredible Julie and I love that it’s dairy-free! Pinned and featuring tonight! Julie, What a great Ice Cream Recipe ! I think , I will mix with some strawberries. You’re welcome, Vera! Thanks so much for stopping by! I think it would be delicious with strawberries. I tried making this tonight but it never thickened up in the ice cream maker. Only change I did was to use coconut milk instead of hemp milk, as that is what I had on hand. Put it in the freezer to see if It helps. Have you ever not had it thicken/set up correctly? Trying to figure out what I did wrong. Thanks! I’ve never had that problem with any ice cream I’ve made so I’m not sure what could have gone wrong. Very yummy! We had it with some freshly made raspberry turnovers and raspberry sauce. My only suggestion would be to halve the recipe depending of the size of your ice cream maker. I have a cuisinart and it could only fit half.